Consider replacing a patch of high-maintenance lawn with lower-maintenance native perennial plants. Plants native to northern Illinois thrive in our and weather conditions, requiring less water once established, and generally do not need fertilizers or pesticides. 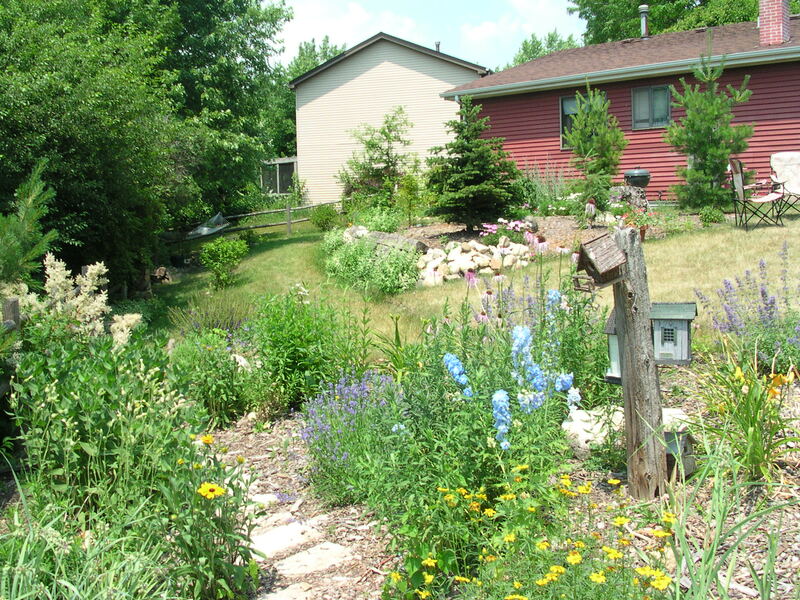 Native plants also provide habitat and food for birds and butterflies. Non-native species compete with and often choke out more beneficial and well adapted native species. Unleash any workplace stress on the nearest garlic mustard, European buckthorn or bush honeysuckle! When using chemical treatments in your yard, follow the instructions carefully, apply only the recommended amount and use these products as sparingly as possible. Check the weather forecast to avoid having to repeat the application. Better yet, hand pick weeds when possible or consider less toxic alternatives. Long-handled weed pullers grab dandelions easily, especially when the soil is moist. Allow beneficial insects like lady bugs, praying mantises, and green lacewings into your garden to feed on pests. For better success, replace diseased or problem plants with native varieties. Don’t Feed the Storm Drain! We’ve all seen the leaves piled in the road gutters, and clogging storm drains when it rains and washes the leaves away. The leaves are washed into lakes, rivers and streams. As the leaves breakdown in the water, they release high levels of phosphorus that causes algae to grow. The algae is harmful to health of ponds and rivers. Place your leaves in your compost pile of bag them for pick-up.